Troubling media reports have undoubtedly contributed to the government announcement of a Royal Commission. It is vital that incidents of inadequate personal care, negligence, neglect, abuse and assault are reported. However, we hear much less about elderly people who are living happily in an aged care home. Nearly two-thirds of aged care residents are prescribed psychotropic drugs regularly. Questions must be urgently asked. 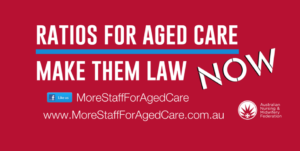 If we want to improve the situation for residents, we need more registered nurses in aged care homes. When registered nurses are on duty, residents have better health outcomes, a higher quality of life and fewer hospital admissions. How many inquiries, reviews, taskforces, think tanks, consultations and consultant reports does it take for the government to change a light bulb in an aged care home? Over the past year or so, the government has investigated, among other things, the aged care workforce, reforms, accreditation, complaints scheme, innovation, standards of care and elder abuse – and still the light globe remains unchanged. To ensure an evidence-based approach to aged care policy and practice, we need research evidence rather than more inquiries, reviews, taskforces and think tanks that privilege stakeholder opinions. To be able to evaluate the proportion of aged care homes that provide high standards of care, researchers like myself need access to data. We need data on quality indicators such as pressure sores, medication errors, weight loss, falls, infection rates admissions to hospitals, staffing levels and training. However, these data are not publicly available. Who decided that data on residents’ safety and wellbeing in aged care homes must be kept top secret? To answer this question, we need to go back more than 20 years when the Aged Care Act 1997 was drafted. John Howard’s Coalition government proved a turning point for aged care policy in Australia. To answer this question, we need data from people who have first-hand experiences in aged care homes – residents, relatives and staff. They know what day-to-day life is like in aged care homes. 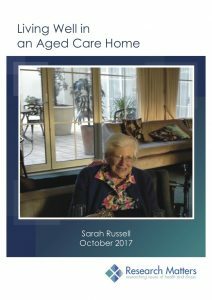 Author Sarah RussellPosted on January 2, 2018 March 14, 2019 Categories Research, StaffLeave a comment on What is it like to work in an aged care home?